We’ve always been advocates of cost comparison, and encourage our potential customers to compare bids for their log homes. 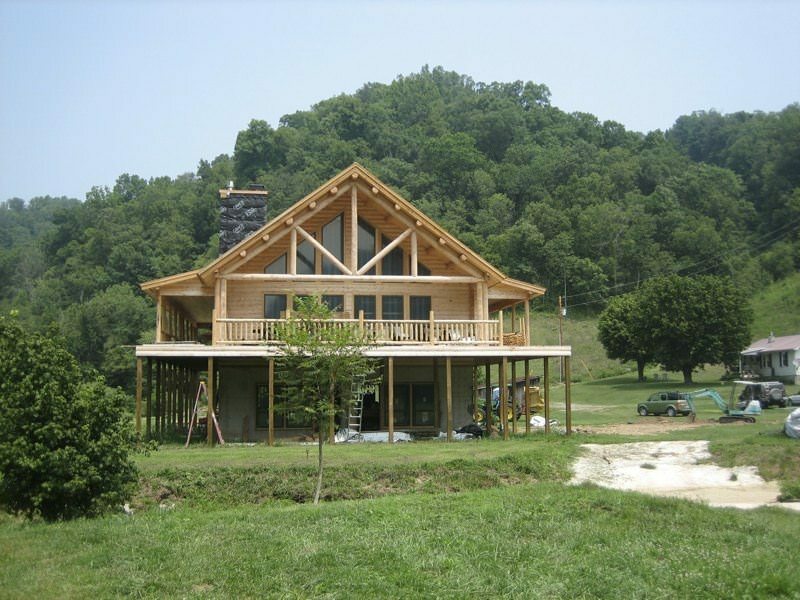 We understand that price is a very big factor in selecting a log home company. But the bottom line doesn’t always tell the whole story. We strongly urge customers to review the details of a proposal closely before agreeing to a contract—both our proposal and those of our competitors! One important aspect of this comparison process is the detailed examination of the bids, so that you understand completely what is included (and what is not) in your log home package. 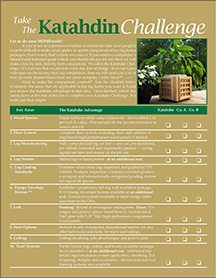 Our Katahdin Challenge is a worksheet that has helped our customers to understand the details by using a 24-point checklist. You can download the Katahdin Challenge worksheet here, or send in your competitive bid(s) and we’ll do the work for you (see item number 4, “Let us do you HOMEwork,” below). 1. Not all “complete packages” are complete. 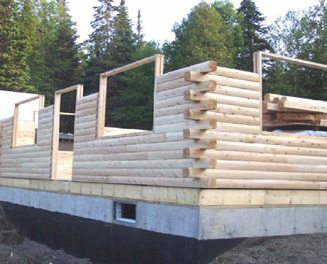 Almost all log home companies claim to have a “complete package,” but the reality is that all “complete packages” are different, and Katahdin’s is much more complete than most. For example, Katahdin includes the following items that most companies do not: Pre-cut and pre-drilled logs; pre-cut window framing materials (bucks); rigid roof insulation; log skirting and false corners; shingles; log railings. 2. If it’s not in their package, you still need it to finish your home. We hear it all the time: “why is your package so much more than XYZ company?” Then, after helping the future homeowner compare the two packages, we find out that XYZ company doesn’t include interior wall framing or the entire loft floor. The fact of the matter is that if it’s included in our package, you need it to finish your home. If they don’t include it, you still need to buy it elsewhere. Some companies offer this extra work as a “benefit” to their customers, allowing them to “shop around” for the best pricing on dimensional lumber, T&G OSB, rigid insulation, or shingles. From our perspective, this just seems to add an extra layer of work: comparing prices, learning quality differences, arranging for delivery, setting up accounts with third parties among other things. Whether you handle this yourself or your builder/general contractor handles it, it still adds time and effort to the process. Because we know exactly what needs to be included to finish your home, we can shop around and use our volume purchasing to get a good price on these elements that are necessary to complete the home. 3. If it’s not done in the mill, it still has to be done on the job site. For 30 years Katahdin has continuously strived to improve its product and manufacturing efficiencies, and today we are extremely proud to have the most complete and precise manufacturing process in the industry. By making cuts that typically have to be done by hand on the jobsite, our computerized house line and laser-guided saws reduce the construction time by days, and sometimes weeks—all while achieving a level of precision that only computers can achieve. Our logs are pre-cut, pre-drilled for log screws, labeled, bar-coded, and packed in the order that they will be needed on the job site. All of this adds up to a more efficient and precise construction process and big savings for you. In the May View From Up North newsletter, we provided a detailed examination of how Katahdin’s house line and laser-guided saws allow your builder and his workers to focus on other carpentry tasks and save time and money in onsite work. 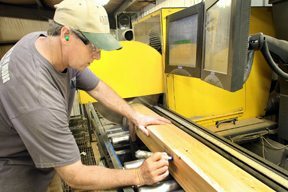 To get a detailed look at how that comes together on our log homes, check out the article here. 4. Let us do your HOMEwork. If you’re not an experienced builder or contractor (like most people!) it can be very difficult to make an accurate apples-to-apples comparison of two log home packages. Don’t worry, that’s where we come in! If you send us a competitor’s detailed and itemized quote then we will make a line-by-line, item-by-item comparison. 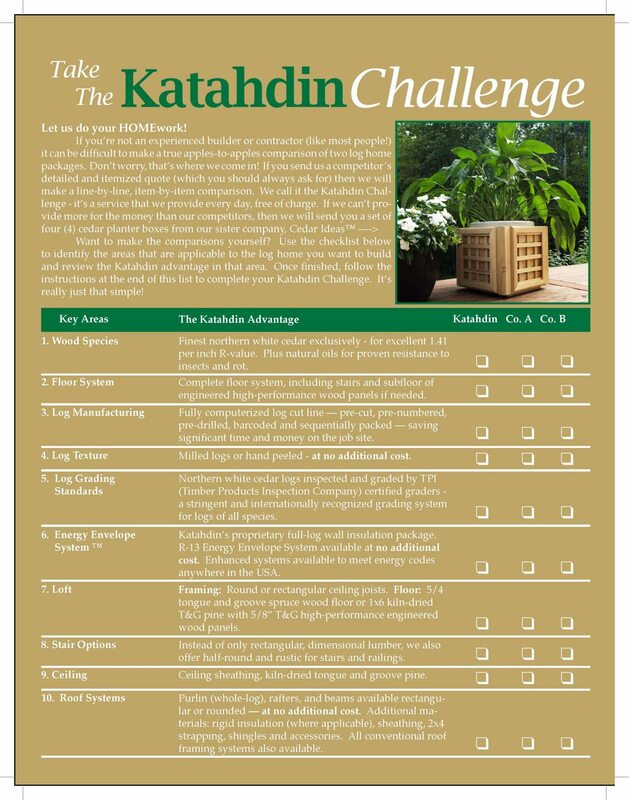 We call it The Katahdin Challenge, a service that we provide every day, free of charge. If we can’t provide more for the money than our competitors, then we will send you a set of four (4) cedar planter boxes from our sister company, Cedar Ideas™. It’s important to us to ensure that our customers truly understand what their log home package includes. Especially if you’re not familiar with the building lingo and abbreviations, you may find that this service will help you avoid a less than satisfactory outcome. Remember, your home is probably the single biggest investment you’ll make in your lifetime. Doesn’t it make sense to pay attention to these details before you sign a contract? 5. A warranty is only as good as the company that writes it. And in these turbulent times it’s more important than ever to research the companies you’re doing business with. We always encourage questions about our business. We’ve been producing log homes for 37 years and our financial foundation is as sound as ever – but don’t take our word for it, call our banker and find out for yourself. We’ll even provide you with his name, contact information and a series of questions to ask. Will others do the same? It’s a real point of pride for all of us at Katahdin that we have been able to weather this economic recession as well as we have. It didn’t happen by accident, but rather through careful planning and investment over good times and bad.